The story of the life of Captain Alexander Morrison (1794-1856), Harbour Master for Aberdeen, is both compelling and harrowing. Alexander was born two days before Christmas 1794 in Foveran, near Newburgh, Aberdeenshire. He was to be the first of five children born to William (Junior) Morrison, a Shipmaster in Newburgh and Jane Thomson. Alexander was born into a family of Sea-farers. Both his father and grandfather were Masters of Shipping Vessels. This clearly provided Alexander with the best possible opportunity to learn the skilled demands of commercial sea-faring. It is very likely that Alexander’s parents were cousins. If you go back to his grandfather’s generation one discovers a fusion of the Morrison and Thomson families of Foveran. It would take more than a little work to clarify this consanguinity, for the entanglement of the families appears fairly deep! At some point in his early adult years Alexander moved from Foveran to the ‘New Fish Toun’ of Footdee. Here he was to become one of Fitties most respected Pilots. 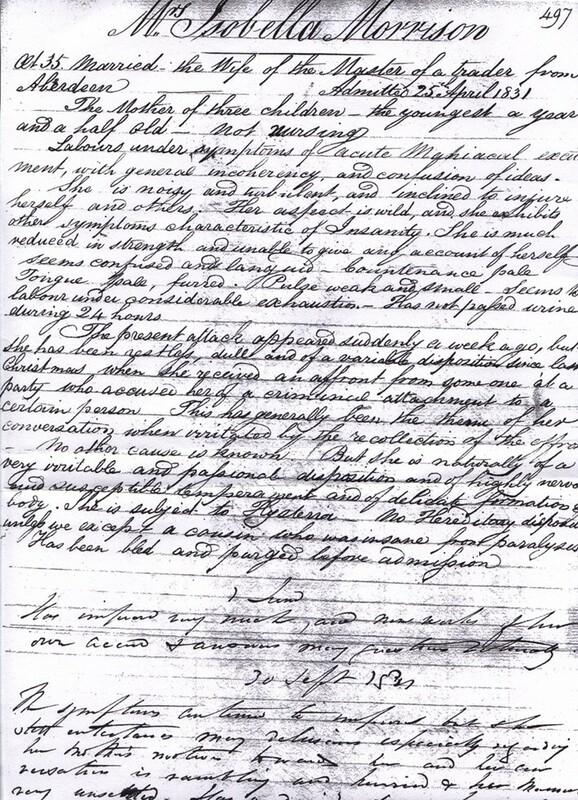 On Monday the 15th January 1821 in Aberdeen, Captain Alexander Morrison married his sweetheart Isabella Allan. In less than a decade their marriage was to be turned on its head – but more of that later. In the autumn of 1829, Jane Thomson Morrison was born at Footdee, the busy fishing village adjacent to Aberdeen’s harbour. Jane, the youngest of the three children born to Alexander Morrison and Isabella Allan, was named after her paternal grandmother Jane Thomson (1771-1848). Jane must have had a fairly torrid childhood, with both her parents suffering catastrophes of very different sorts. Her mother, Isabella Allan, was to endure for most of her adult-life, mental illness. Her father Captain Alexander Morrison, Harbour Master had an arduous and dangerous job, which would have left him little time for his family. The admission note is an incredible document and remarkably comprehensive for such an early date. The hand is in beautiful script and the prose generally flowing. The doctor rules out both a hereditary cause and General Paralysis of the Insane. The latter resulted from syphilis which was certainly not uncommon amongst seafarers! Isabella was at a prime age for insanity and was to be its insidious victim. Apparently she had been upset at a Christmas party when she felt ‘black-affrontit’ at a comment made by one of the party. Isabella believed that she had been accused of fraternising with a criminal element. Incoherency generally meant loss of ordered speech with looseness of ideas and inconsequentiality, often combined with paranoia. In Isabella’s case she is described as having a most ‘passionate’ disposition rendering her, in the eyes of the doctor, ever more susceptible to mania. Age 35yrs. Married, the wife of the Master of a trader from Aberdeen. Admitted 25th April 1831. The mother of three children, the youngest a year and a half old. Not nursing. Labours under symptoms of acute Maniacal excitement with general incoherency and confusion of ideas. She is noisy and turbulent and inclined to injure herself and others. Her affect is wild and she exhibits other symptoms characteristic of insanity. She is much reduced in strength and unable to give any account of herself. Seems confused and languid – countenance pale; tongue pale, furred; Pulse – weak and small. Seems to labour under considerable exhaustion. Has not passed urine during 24 hours. The present attack appeared suddenly a week ago, but she has been restless, dull and of variable disposition since last Christmas when she received an affront from someone at a party who accused her of criminal attachment to a certain person. This has generally been the theme of her conversation when irritated by the recollection of the affront. No other cause is known. But she is naturally of a very irritable and passionate disposition and a highly nervous and susceptible temperament and of delicate formation and body. She is subject to Hysteria. No hereditary disposition unless we accept a cousin who was insane from paralysis. So poor little Jane, and her older brother William and sister Isabella, for in the realest of terms, they never knew their mother. 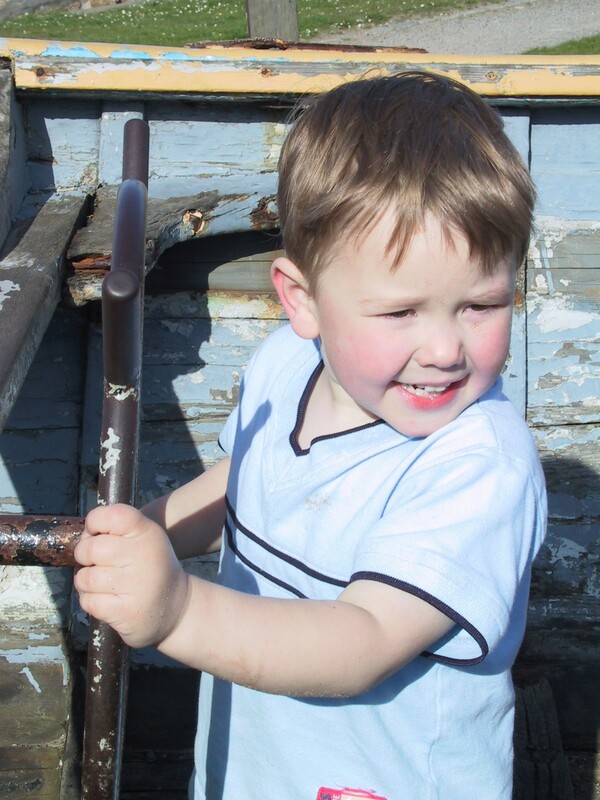 It is likely that at this stage, that their grandmother, Jane Thomson, moved in to help Alexander raise his children. Jane Thomson certainly appears on the 1841 census. So until her death in 1848, “Jane the grandmother”, was to be Jane and her siblings, ‘mother’. 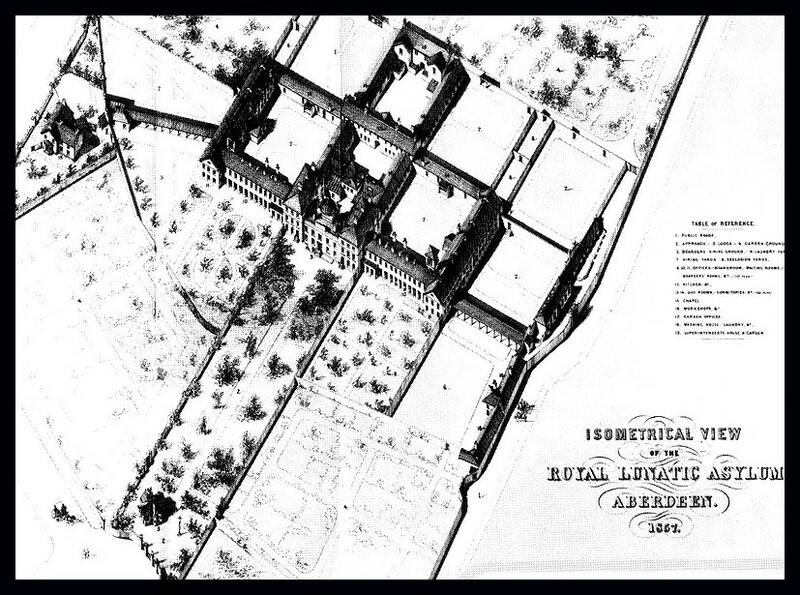 Figure 3: Royal Lunatic Asylum, Aberdeen where Isabella spent nearly all her adult life. I trained in psychiatry in the very building in which poor Isabella Morrison was detained. I walked its eary corridors which sprang creakily with age. I served its people and was proud to do so. With a doctors eyes I could see the person – the true Isabella, and how she came to my mind on long nights on call. The hospital carries fond memories of ‘community spirit’ for me and just perhaps that camaraderie of person might just have spanned the previous century. Certainly Isabella’s notes depict that her doctor at least, understood and cared. Jane was seven years old when, on the 4th May 1836, her father, Captain Morrison was appointed as Captain Pilot for Aberdeen Harbour. This was the most honoured and responsible of all positions elected by the Harbour Board. With his employment Captain Morrison was issued with a series of regulations by which he was sworn to abide. He was to continue in this role for fully two decades. Although Alexander’s employment brought financial rewards, prosperity did not follow, as much of his income was consumed by the costs of private Asylum care for his wife. This would have amounted to something in the region of £15 a year, which in 1836 was nearly half of Alexander Morrison’s annual salary. As said, Jane was the youngest child. Her brother William was five years her senior. He was to become a Grocer, running a shop, first in Portobello and later, in Leith, Edinburgh. He married late on in life, an Aberdeen lass, called Margaret Birnie. They called their only son, William Birnie Morrison. Jane’s only other sibling was her beloved sister Isabella, who appears never to have left her side. Isabella remained a spinster, and when Jane later married and moved to Edinburgh, Isabella went with her. One is left to wonder if she had been emotionally scarred by her mother’s illness during her early years. At any rate, she died in her sister’s house in Leith in October 1879. It is worth recording that Jane and her sibs would have spent most of their childhood in one of Aberdeen’s oldest and most historic houses – the Round House of the North Pier. It was the privilege of the Harbour Master, also known as the Captain Pilot, to live on the middle floor of this building. Accommodation was rent free, and the Morrisons’ lived there from 1836 to 1856. The Round House (it is actually octagonal) has stood at the junction of the Pocra quay and the North Pier, since the late 18th century. 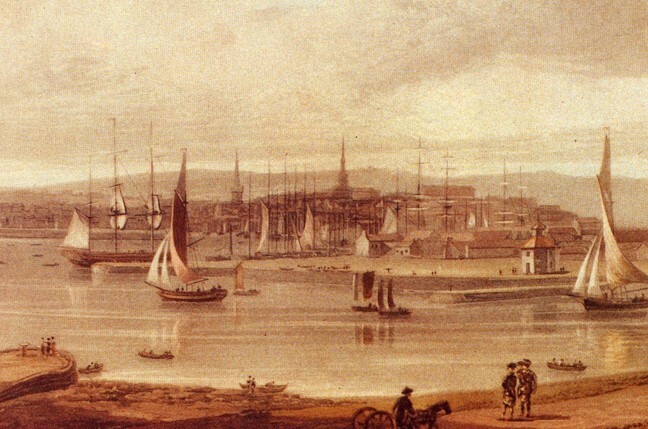 Indeed it is scrupulously drawn in Colin Innes’s Plan of Footdee of 1803; and in William Daniell’s engraving of Aberdeen in 1822, its red roof can be seen surmounted by a turret that commands harbour and bay. Examination of the Shoremaster’s Accounts for 1797, reveal that the Round House was built at a cost of £225 5s. It was at the Round House in August 1986 that the Queen unveiled one of Pocra’s famous plaques. This one commemorates Aberdeen harbour’s 850 years as a going concern. 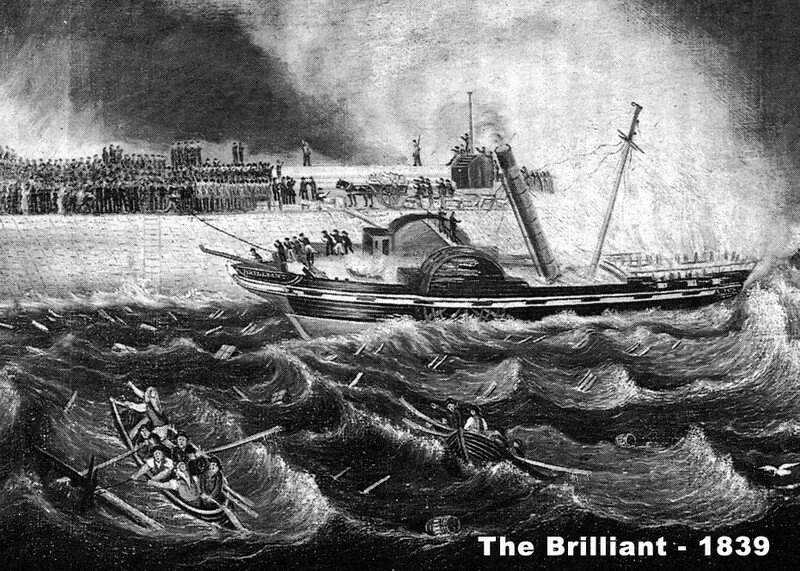 Captain Morrison must have agonised when three separate disasters – the harbour shipwrecks of the Brilliant (1839), the Velocity (1848) and the Duke of Sutherland (1853) – resulted in unprecedented loss of human life. Although the first steamer had entered Captain Morrison’s Aberdeen harbour as early as July 1820, the wooden paddle ship Brilliant was the first to be lost on the coast of North East Scotland when she went ashore on the harbour entrance on the 12th of December 1839. At 159 tons gross she was relatively modest in size (at least by today’s standards) but had considerable historical interest having been built at Greenock in 1821, with Bell undertaking his pioneering work on the Comet only nine years previously. The Brilliant had sailed from Leith the previous afternoon. Captain Morrison had been woken during the night with a raging south-easterly gale – this overtook the Brilliant, and early the next morning off Girdle Ness, her master, Captain Wade, standing on the quarter deck was thrown overboard when the ship rolled violently in a particularly heavy sea. As it was well before dawn there was not the slightest chance of the unfortunate man being saved and those on deck had no chance but to run for the harbour entrance. In the beam seas the steamer was carried too far to leeward and struck the North Pier just inside the seaward end. Captain Morrison was at this stage unaware of the unfolding drama as succeeding seas drove the Brilliant further onto the root of his pier. It was at this point that the chief engineer abandoned the engine-room and rushed on deck. The unfortunate passengers were left more or less to their own devices in the pitch darkness with the accompanying thunder of breakers and the roar of escaping steam. When the Brilliant finally came to rest she had been driven hard against the pier and those on board were able to scramble ashore without too much difficulty, one of the passengers breaking his leg in the rush to leave the ship. Poor Captain Morrison, it was at this stage he awoke with the cries of the survivors to a ship wreck on his very own pier. Surely he must have felt he had failed them and perhaps he had. That detail is just unknown. What can be said for sure was that he continued in his job with neither reprimand nor commendation. It was simply that, a terrible tragedy in the middle of the night; without an alert system what else could have been done? Captain Morrison did not miss all the action: as one of the female passengers was handing her children ashore the wreck rolled away from the pier and she was left stranded aboard along with the second engineer and the cook. With considerable presence of mind the cook made fast a length of rope around the woman’s waist and threw one end to those on the pier. With the cook and engineer holding the other end to prevent her from being flung against the pier she was pulled ashore to be quickly followed by the two remaining survivors. As the paddle steamer had been abandoned in such a rush there had been no time to draw the furnace fires with the result that the boilers, now empty of water, rapidly over-heated, setting alight to the wooden hull. The stern was soon burning fiercely and even though a fire-engine was brought out along the pier (assumedly under Captain Morrison’s instructions) it proved impossible to extinguish the flames. Efforts were then concentrated on saving the cargo all of which was transferred ashore before the steamer burned out and broke up. Only two days after the wreck, several lots of shawls from the cargo were advertised for sale by a local firm in the same issue of the Aberdeen Journal that carried an account of the Brilliant’s loss. It being close to Christmas and the firm run by good Aberdonians they were presumably anxious to catch the seasonal trade and turn a little extra profit! Anniversaries sometimes occur with blinding glare, at least it must have seemed like that for Captain Morrison, for nearly a decade on from the loss of the Brilliant, another wooden paddle-steamer the Velocity, was lost in almost identical circumstances. The day of deed was the 25th of October 1848. Was this to be the final blow for the beleaguered Captain Pilot? Well for that you must wait. However you can picture the domestic scene in the Round House: Alexander, the Captain & patriarch was 54 years and coming towards the end of his long stewardship of Aberdeen’s maritime gateway; his wife, Isabella, had been in private Asylum care for the best part of 17 years; his three children were growing fast and now no longer even teenagers. Yes Captain Morrison’s life was on the cusp of retirement and here he was beset by another disaster. Yet disaster to a man of long family tradition of seafarers must have been accepted as part of a dangerous trade which was at the mercy of the seas. When the Velocity arrived in the bay of the Dee it was low water and she lay off for about an hour and a half until the leading lights were lit at dusk. It is clear that her master, Captain Stewart, did not appreciate the fact that the lights were lit regardless of the tide and steered straight for the harbour. Figure 8: The North Pier struck twice. The wind, blowing strongly from the south-east combined with a strong fresh in the Dee to produce a heavy sea off the harbour mouth and it was here that the paddle steamer was struck on the starboard quarter by a large wave. Her head was driven to the north and before she could be brought back on course she struck the extreme south-east end of the North Pier. 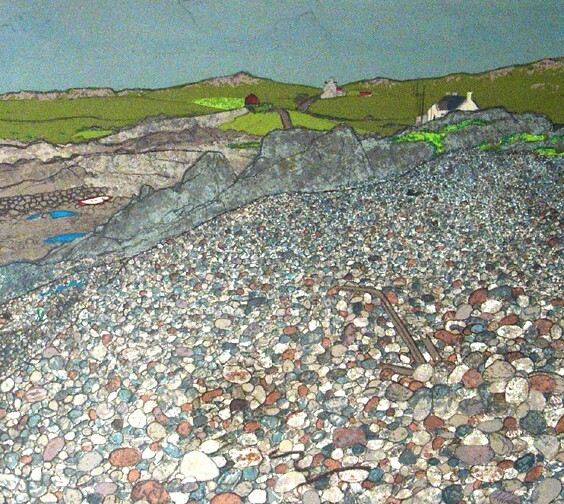 The North pier – home of Captain Morrison – had struck again. It had a horrid vengeance. The Velocity struck with such force that her back was broken and she remained lodged fast on the toe of the pier. Although the lifeboat was called out almost as soon as the steamer struck, a great deal of time was lost in gathering a volunteer crew. Captain Morrison was doing his best– but he had neither the means nor the established organisation to garner Pilots quickly from Fittie. By the time the pilots rescue boat was launched, the steamer’s long boat carrying five of the crew, had managed to get away from the wreck and reach the safety of the harbour. The Velocity broke up with the poop deck carrying the master, mate eight passengers and the remaining five crewmen out into the main channel. They were rescued just in time by the pilots lifeboat which had finally been manned and launched by fishermen who ‘conducted the boat nobly, and took the men off the wreck and brought them to land in the most dextrous and sealike manner.’ We do not know if Captain Morrison was aboard, but I am inclined to think not as it was later claimed that no one had ‘full authority to take charge’ during the rescue operation and even so the pilots were ‘unwilling’ to volunteer for crew claiming they seldom received anything for their efforts. It had been impossible to salvage anything from the stranded steamer which broke up and disappeared in less than an hour. Wreckage and cargo were strewn along the Torry side of the river and in spite of guards being set a great deal was stolen under the cover of darkness. In a search the following morning police made several ‘painful’ discoveries. Captain Morrison must have been rearing sick. The following morning he made his own ‘painful discovery’ for his mother, who had stood by him all the years, and acted as mother to his own children, was found dead in her bed. Poor Alexander – what a terrible night he had had. On the wall of our‘Family Room’ there is a print – it came from an antique shop in Aberdeen and was bought in the autumn of 1998. It depicts the sinking of the Duke of Sutherland at entrance of Aberdeen’s port. Whilst in the shop, I explained that my great-great-great grandfather had been the harbour master on the day of the tragedy – the 1st April 1853. The antique dealer than procured a treasure – a china dish that had survived intact from that very shipwreck. I had no money (isn’t that always the case!) so the sale could not eventuate, but one thing led to another, and the dealer related how he had planned to take that china piece to a new home: the home he had planned for it, was none other than Hallhead castle. Had he heard correctly – ‘Hallhead castle’ – the seat of the Bovagli Gordons! I explained that if ever there was a castle to which I aspired it was the endearingly domestic and utterly quaint Hallhead. The world is full of funny coincidences. By way of comment, the antique dealer explained how his offer to buy Hallhead castle was withdrawn by the farmer at last minute. He was, he assured, bitterly disappointed. The paddle steamer the Duke of Sutherland belonging to the Aberdeen Steam Navigation Company had sailed from London on Wednesday the 30th March 1853 with a general cargo and twenty-five passengers. At first the weather remained pleasant but deteriorated steadily and by the time the steamer arrived off Aberdeen it was blowing a full south-easterly gale with heavy rain. As it was low water she had to anchor off during the afternoon until the tide flag was raised shortly after five o’clock. A strong spate coming down the Dee combined with the tide to raise a heavy confused sea on the bar, exactly similar conditions to those which had led to the losses of the Brilliant and Velocity. 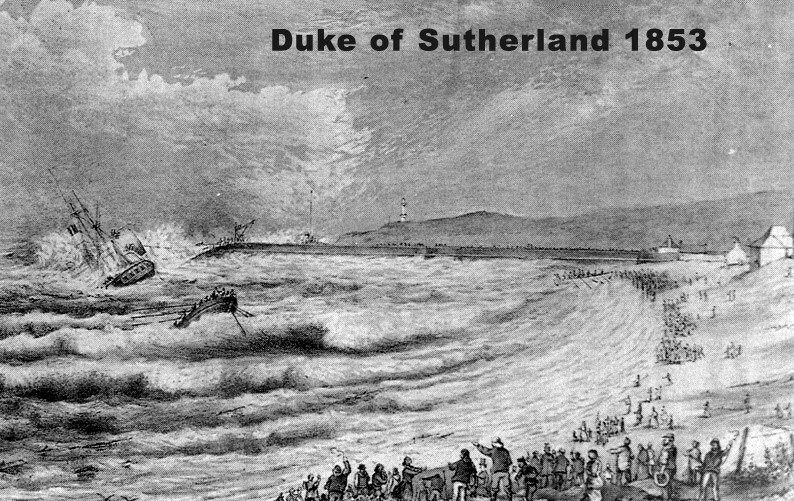 In a fatal repeat of these tragic events the Duke of Sutherland was driven completely off course after being struck on the starboard quarter by a very heavy sea. In spite of five or six men struggling with the helm and the engines being put astern she was completely swept by a second sea which drove her onto the seaward end of the North Pier and extinguished the furnace fires. The Duke of Sutherland was holed in the vicinity of the boiler room which flooded rapidly with the engineers and stokers having no choice but to abandon their positions. The steamer was then flung broadside on to the end of the pier before settling on the rocks and starting to break up with the fore-mast soon going over the side. Captain Howling, directing operations with great coolness from the bridge, succeeded in having one of the lifeboats launched just as the bow section broke off and the stern settled further in the water. One of the lady passengers was seriously injured when she jumped into the lifeboat while another apparently fainted in the increasing confusion and was swept away with her body being washed up on the beach later. In the very severe swell the lifeboat, in charge of the mate and only containing seven men and a woman, was driven from the side of the stranded steamer before it could be filled and drifted safely through the surf to the beach. The harbour lifeboat had been launched under Captain Morrison’s instruction within twenty minutes of the steamer going aground but having been driven against the wreck and damaged; she had to make for the safety of the beach carrying only fifteen survivors. This still left some thirty people on the rapidly disintegrating wreck sheltering around the starboard paddle-box. Captain Morrison commanded volunteers to help him retrieve lifelines from his Round House, he knew that they could be fired to the stranded using Dennett’s Rockets. However the plan was initially a miserable failure, the frantic Captain Morrison must have been cursing as the damp fuses refused to light. It took twenty attempts before even one Rocket fired and several more attempts before a lifeline actually fell across the wreck. After that a pier hawser was successfully drawn aboard but with no proper cradle available one had to be improvised from a box that had floated free from the wreck. It became obvious however after the first person (one of the female passengers) had been brought ashore that this was unsatisfactory and large rope slings were substituted instead. At this point the whip became entangled and Captain Howling, having just been knocked down by a wildly swinging quarter boat while saving one of the female passengers entangled in the stern netting, tried to free it but fell off the warp into the sea and drowned in full view of his brother who was on the pier. Simultaneously a salmon coble manned by some seaman and the steamer’s second mate, Peter Ligterwood, who had been brought ashore in the harbour lifeboat managed to put off from the beach and pick up several people who had been washed off the poop of the wrecked steamer. On the way back to the beach the coble fouled some nearby salmon nets and capsized, only one of the crew of six men reaching the shore alive. It was then that the hero of the disaster emerged. The Chief Steward, Duncan Christie, took charge of directing rescue operations on the stranded paddle-steamer and with a mixture of extraordinary effort, encouragement and the occasional threat succeeded in safely sending ashore the twenty or so people who were still aboard the midships section. Finally, having ensured that all of the survivors had reached the pier safely Christie left the wreck with a knife clenched between his teeth in case the rope pulling him ashore became entangled. In fact this is exactly what did happen and he had to cut himself free just as he reached the pier. 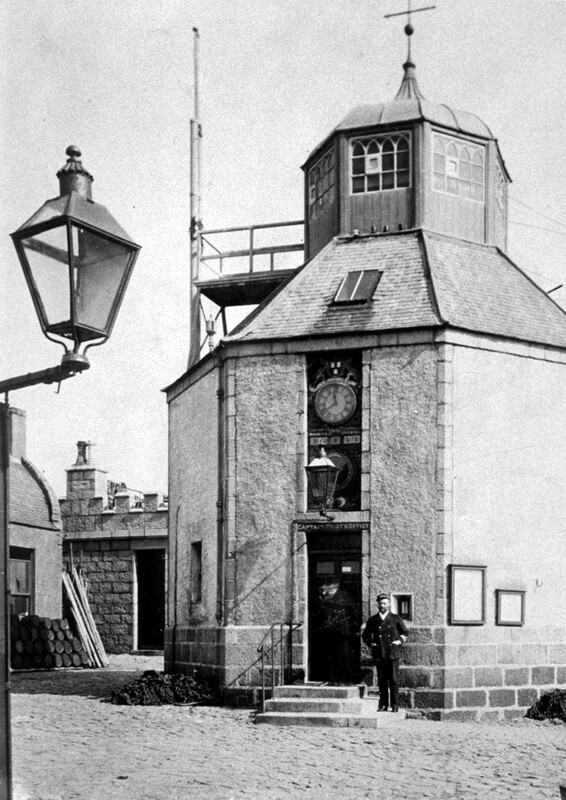 Because of the heavy loss of life Aberdeen Harbour Commissioners immediately appointed a full-time paid crew for the lifeboat and ordered an inquiry into the state and availability of the rescue equipment held at the harbour. It emerged that the lifeboat had arrived alongside the casualty only half an hour after she had struck but had been so badly damaged by floating debris during the rescue that she was unable to return to the stranded steamer. Severe problems were caused by nearby salmon stake-nets which entangled some of those swept off the steamer and fouled the coble while it was alongside the steamer. The delay in the use of the Dennett Rockets was found to be due to a combination of inexperience, heavy spray soaking the rocket fuses and misguided interference from the huge crowd of onlookers. On a happier note the Chief Steward’s bravery was awarded with £5 and a gold medal by the Shipwrecked Fishermen and Mariners’ Royal Benevolent Fund. Captain Morrison must have felt utterly beleaguered. Certainly history had served him poorly with three shipwrecks in one career. The loss of the Duke of Sutherland was more than just sore it was harrowing. It marked the dropped flag to Captain Morrison’s long service to Aberdeen and its gateway to the sea. The dismal failure of the Dennett Rockets in particular, must have left the Captain with a feeling of failed duty. Three months after the Duke of Sutherland was shipwrecked, Captain Morrison was served with newly issued regulations made after an emergency meeting of the Harbour Board. The regulations leave no doubt that this was in effect a reprimand, but more than that, a realisation that safety of the harbour was the Captain Pilots over-riding duty. Reading the list I was left to feel sorrowfully sick for my great-great-great grandfather. The Captain had in so many ways failed and yet he had paid for it with his bodily health as it oozed any lingering strength. In another life, no doubt the Captain would have done differently. The Captain Pilot shall have the superintendence of all other Pilots & do his utmost that the regulations for their government be strictly complied with. He shall not engage in any other employment. The Captain Pilot & Assistant Pilot shall attend the North pier & adjacent quays every tide, at least 3 hours before high water, and at least 2 hours after high water, & shall remain as long as it shall be considered safe for vessels to enter or leave the harbour. The Captain Pilot must take care that the reflecting & lighting apparatus at the North pier end is kept in the very best order & the light hoisted every night at half-flood & taken down at high water. During daylight the flag is to be hoisted at half-flood & kept up as long as the Captain Pilot may deem advisable. 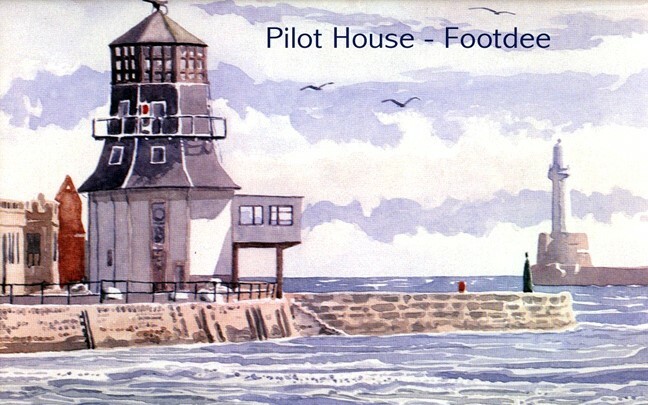 Should there however be a heavy fresh in the river Dee with a rough sea at the harbour entrance, the Captain Pilot is not to allow a light or flag to be hoisted until one hour after the flood, but the pier light & flag respectively shall be exhibited only when in the opinion of the Captain Pilot vessels can enter the harbour safely. He shall cause the shipping be supplied with Pilots according to their order & to the best of his judgement without partiality or favour. He shall make out and certify the accounts for pilotage and berthing as according to the annexed table of rates. He is empowered, where there may be great difficulty & danger in the Pilots getting out to the assistance of vessels in the bay to offer them such moderate premiums for their services. In case he shall be called upon to furnish boats or men to the assistance of any vessel in want thereof, or in distress and shall either refuse, absent himself or neglect to comply with such request he shall (on proof), for the first offence pay a fine of £5, for the second £10, and for the 3rd offence discharged from office. He shall keep a book in which he shall regularly enter a list of arrivals and departures of all vessels to the harbour. Should any special circumstances occur with reference to the improper conduct of the Pilots, the Captain Pilot is immediately to investigate the case and if he shall consider it necessary, report to the commissioner. The Captain Pilot shall have special charge of berthing all ships & vessels at the lower quays & sasins. The Captain Pilot & assistant Captain Pilot shall take the depth of water from the entrance of the Harbour along the whole navigation channel and dock to the upper end thereof. The Captain Pilot must collect all the harbour DUES leviable from all vessels not belonging to the port. The Captain Pilot must take care that vessels are at all times kept clear of works carrying on for the improvement of the harbour. The Captain Pilot shall have the care & control of the life boats and crew, and the life preserving apparatus. He shall direct that at the commencement of the months of Sept, Oct, Nov & Dec, the keeper of the leading lights, assistant Captain Pilot, the Dock Masters, the Dockgate men & the Harbour Police, shall be taken out at such times as not materially to interfere with their other duties for the purpose of practising the use of Rockets, Manbys and other life-preserving apparatus. Also that the Captain, mate & crew of the life boats take one of the life boats afloat for exercise fully manned, at least once a quarter, giving preference to blowy weather & taking the boats to the North Pier & Broad Hill alternatively. The Captain Pilot & assistant Captain Pilot shall immediately give the alarm when they are informed or discover a vessel in distress, within or near the harbour & shall without delay despatch a messenger to the Dock Masters, Harbour Police, Harbours Office & Harbour Superintendant to attend. Immediately after the life boats & life preserving apparatus have been used for saving life the Captain Pilot shall with the aid of the crew of the life boat, get the life boats & life preserving apparatus returned in as good order, and as speedily as possible to their respective houses. The Captain Pilot will also see that the book containing the Reports by the assistant Captain Pilot, as to the state of the life boats & life preserving apparatus is kept & examined by himself. In the event of a shipwreck occurring the Captain Pilot is, in not less than two days thereafter to make a written report of the same to the clerk of the commissioners. No picture survives to depict the Captain and whatever the truths, his life had certainly been hard yet he had demonstrated true fortitude in being retained as Captain Pilot for twenty years. Despite the utter lows of the ‘Duke of Sutherland,’ Captain Morrison must have been well thought off or that record would not have stood. Captain Alexander Morrison was buried in Lair II 84 under this tree (below) in St Clements Churchyard. He was given no tombstone. That is surely sad as he had served Fittie through good and bad and he had certainly survived from one disaster to another, and all without the support of a ‘guid’ wife by his side. A year on from the death of her father, Jane married. It can be but speculation, but one wonders if either her father disapproved of her love for George Duncan, or that simply the circumstances prevented her (caring for her father in his sickness). George Duncan, her new husband, appears to have been offered (by one of his siblings), a job in Edinburgh as a ‘Provision Agent’, and within months of their marriage, they had moved to Leith. 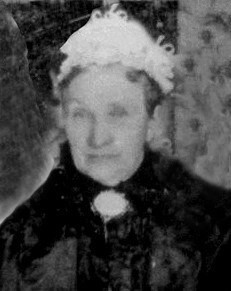 In 1868, Jane’s mother, Isabella Morrison (nee Allan) died in the Asylum. She was demented, riddled with tuberculosis, and recorded as a ‘pauper patient’. At some point between 1856 (the year of Alexander Morrison’s death) and 1868, her children had stopped to provide payment for her care. Perhaps they were not able. Perhaps they could not bear to witness her illness. Whatever the reasons, they were certainly not present at the time of her death, as her death-bed informant was recorded as Robert Jamieson, a ‘husband of the deceased’s niece’. Poor Isabella Allan, what a sad life she must have had. 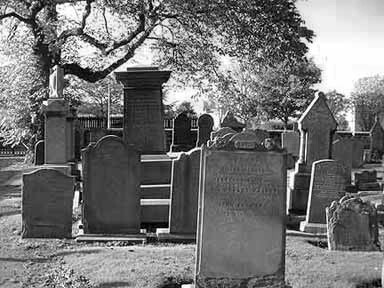 To the credit of the Asylum however, she was not to be buried in a pauper’s grave, but beside her husband in St Clement’s Churchyard, Footdee. Jane T. Morrison and her husband George Duncan, lived in several properties in Leith during the mid years of the nineteenth century. They were not destitute, but money was clearly tight. Together they had five children, although one, Martha Jane, died in infancy. 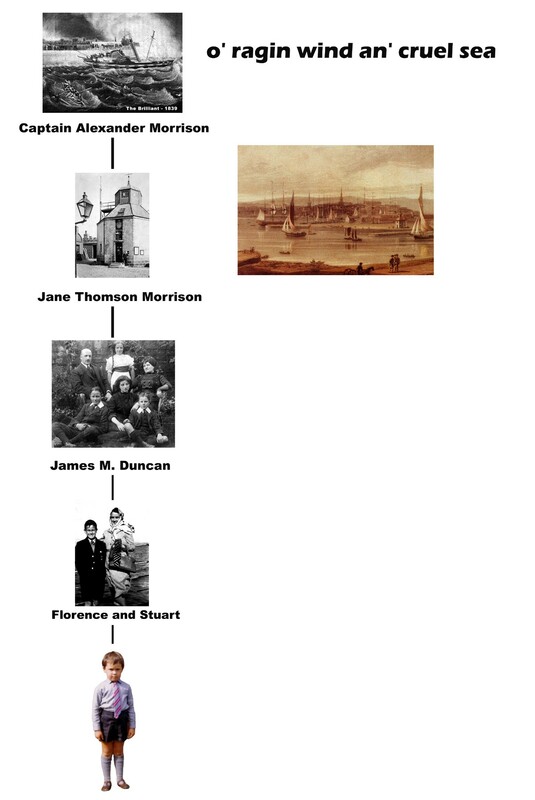 Their youngest child, James Morrison, born in 1865, was the grandfather of the Stuart Gordon (my father). Jane, it appears, did not have to seek her troubles, for in 1878 her husband George died after a most sudden illness. Age 48 years he developed meningitis and lasted just five days. A year later, her sister Isabella Morrison (who was living with them) also died. Jane was then left entirely alone to raise her children. By 1881, Jane and her family had moved away from Leith, and Figure 14: Jane Thomson Morrison were renting a flat next to the Meadows. In August of 1912, in the home of her son James Morrison Duncan, Jane peacefully passed-on. She took with her the compelling but sad story of her family.